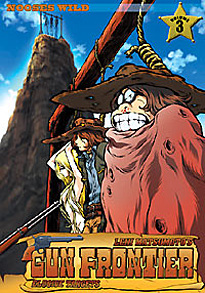 Tochiro and Harlock's journey across the American West leads them to the Wild Utamaru - the man responsible for betraying Samurai Creek, and a fierce duelist with the samurai blade. For the pain and torment he has brought unto Tochiro, there is only one cure. The two swordsmen will meet for a midnight duel in the rain. But behind Utamaru there still lurks the Organization and their plans to capture Tochiro and hang him high!